Home » Blog » Family Vacations » San Diego - Top Family Vacation Destination » Is the LEGOLAND California Brick or Treat Party Night Worth The Extra Cost? 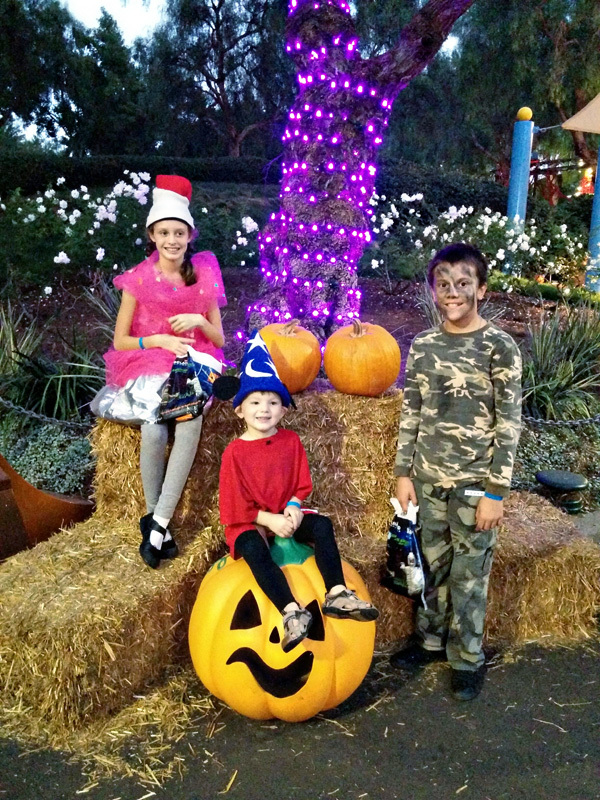 LEGOLAND Brick or Treat Party Nights is a spooktacular family-friendly nighttime Halloween event that takes place on select evenings in the fall at LEGOLAND California in San Diego. 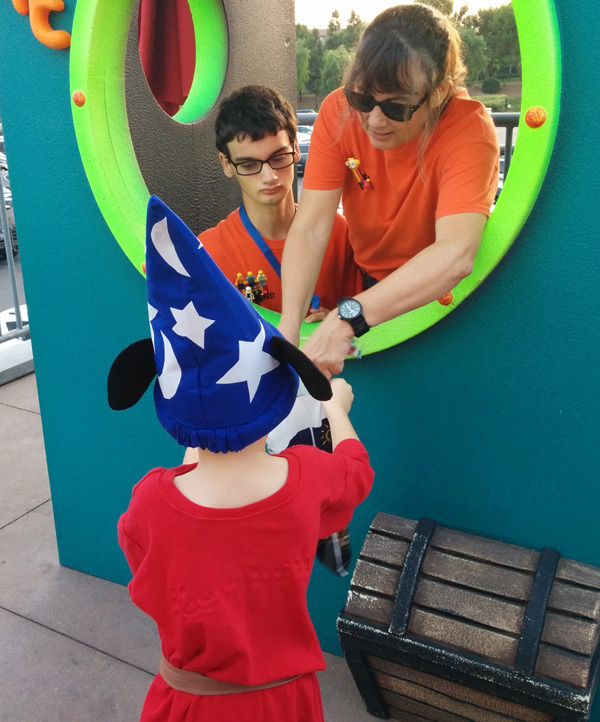 Guests can dress in costume, collect goodies at “brick-or-treat” stations or participate in a dance party and costume contest. Or they can simply enjoy the rides and attractions that LEGOLAND has to offer! 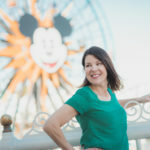 Our Day Trips TravelingMom shares her thoughts on if the additional cost for the nighttime event is worth it and what you can do to maximize your visit. 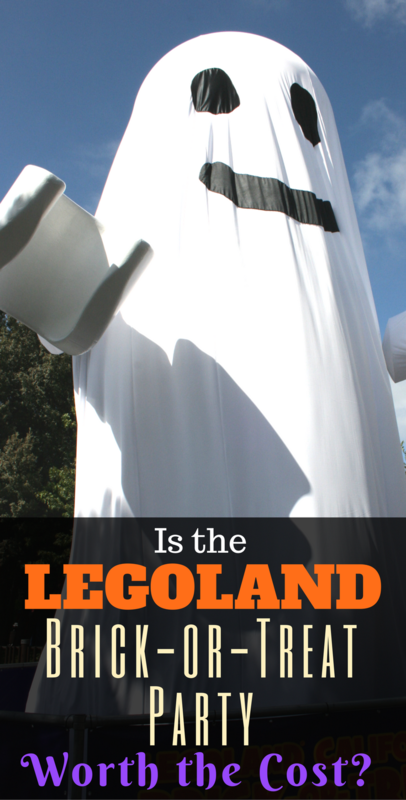 LEGOLAND’s annual Halloween celebration, Brick or Treat, takes place every Saturday night from the end of September until Halloween (Sept. 30, Oct. 7, 14, 21, & 28). Ticket holders to the event arrive as early as 4 p.m. After ticket scanned at the entrance, you’re given a wristband. Although guests are allowed to explore LEGOLAND on the day of the event, to stay past 5 p.m., wristbands are required. 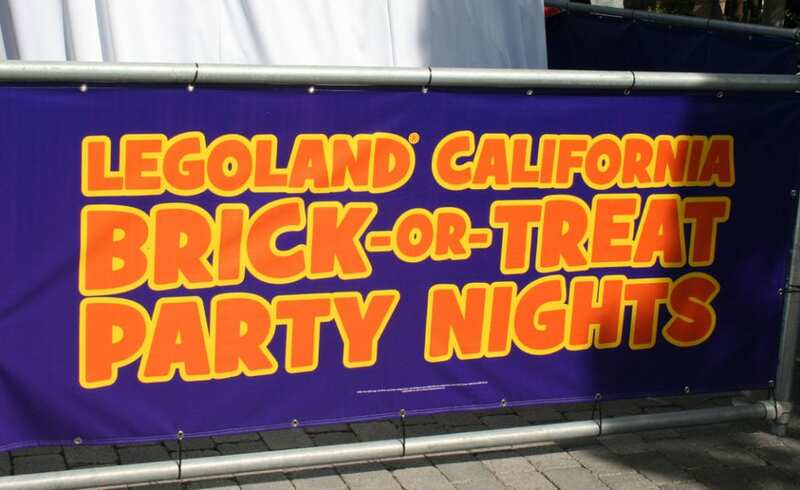 For the past several years, my family experienced the LEGOLAND California Brick or Trick Party Night. Last year we started the night at the LEGOLAND Sea Life Aquarium. After walking through the exhibits, my kids picked up their treat bags to “Brick or Treat” at various stations located throughout the Park. Since this is a limited ticket event, I expected lighter crowds. However, the lines were just as long as they’d been on the busy Saturday afternoon when we’d visited a few weeks prior. In fact, I found the crowds to be extremely heavy. Expect to wait for everything. 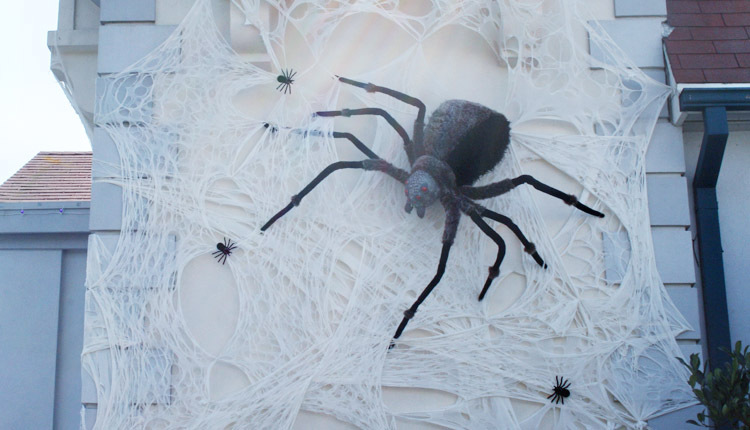 TravelingMom Tip: Attending to the Brick or Treat Party Night? 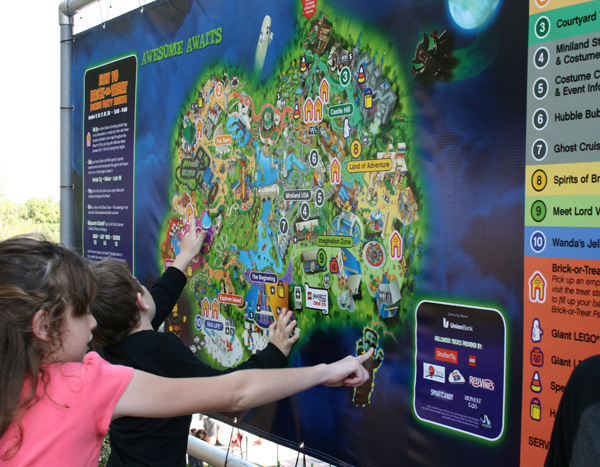 Accept that doing both rides and participating in the special Halloween activities will be very difficult. You’ll likely have to choose one or the other or just do a few of each. We “tricked or treated” at about seven stations, went on four rides, and ate dinner over the course of four hours. LEGOLAND does a nice job of incorporating the Halloween event into their park. 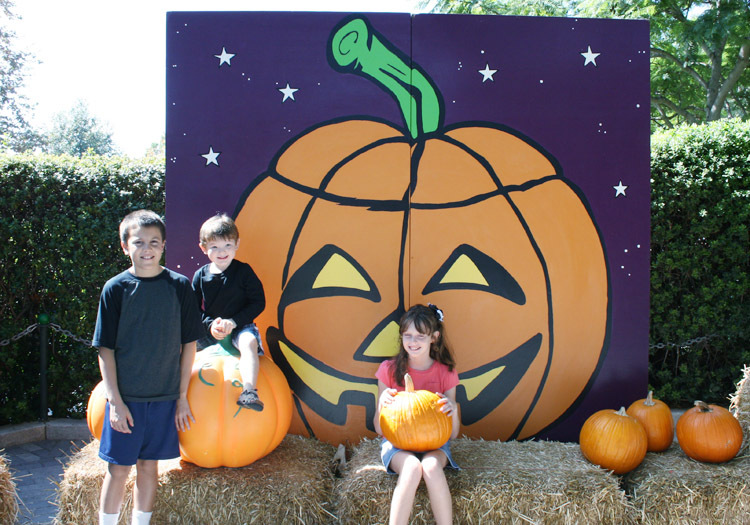 During the day, sections in the park feature pumpkins and hay bales for photo taking, as well as fun Halloween touches and decorations in various areas. Once night falls and the Party Night kicks in, there are various Brick or Trick only events that take place. LEGOLAND California’s Heartlake City hosts a Harvest Festival complete with the BOOgrass Band. There is also a LEGO pumpkin patch building activity. The Coast Cruise transformed into the Ghost Cruise, a Halloween twist complete with tiny LEGO ghosts placed throughout the ride. Themed entertainment is staged around the Park with “The Curse of the Hallowmeenie” show and entertainment from The Witchettes. There is also an annual costume contest with prizes being LEGO-themed! Prizes included LEGOLAND California admission tickets, LEGOLAND Hotel stays and LEGO toys. We didn’t participate in the contest this time but we did see quite a few very creative costumes on the kids walking through the Park. I saw some adults dressed in costume as well. If you’re already making a great costume, entering the costume contest during this event is highly worth it for the fantastic prizes offered. Though the lines for the Treat Stations are very long in some areas of the Park (and don’t dissipate in size even towards the end of the event), they move quickly. I also appreciate that there were employees holding tall signs that shows where the “END OF THE LINE” was. The sign also explains what treat is being given away. At one station, my kids received a large-sized package of Red Vines. At another they received Clif Kids Z-bars. Coveted Brick-or-Treat Commemorative LEGO bricks and LEGO comic books are also popular giveaways. The treat stations are all quite generous, which was nice. In some areas, it is difficult to stay in a line without having random people walking by cut in. Perhaps roped off areas would work better to keep lines separated from the moving foot traffic. There are several dance party locations throughout the Park. New this year, the Model Shop roof will be the home to The AstroBash, a space themed dance party. A new Midnight Monster Jam at Fun Town Stage lets families boogie down with the monster crew. Enthusiastic costumed employees encouraged the kids to join in the party and dance. Everywhere throughout the park, roaming performers entertain the crowds and stop for photos. Entertainers are hard to miss and add to the creative theming of the night. You’ll find them on stilts, unicycles, or balancing on top of a ball! We also spotted large-sized LEGO characters posing for photographs. Of course, there are lots of fall-themed backdrops throughout the park at which to take pictures. LEGOLAND has some creative and unique food choices through the park. One year we ate dinner at the Sea Life Aquarium in Ocean Journey Cafe. Another time we dined at Fun Town’s Urban Kitchen. Meals are often prepared in front of you. This means it’s fresh and hot. It also means that meal prep can take a bit longer than expected, so prepare to wait in line. Prices are higher than other theme parks ($8.95 for a kid’s meal) but they offer a good amount of food. I was able to order just two meals and divide them among three children. There are also healthier options for sides, including swapping fruit or low-fat chips for fries. I went with gourmet mac n’ cheese, which was freshly prepared in front of me. Topped with grilled chicken and a sprinkling of breadcrumbs, tomatoes and freshly chopped basil, my meal was rich and satisfying. So much better than boring chicken nuggets! There are unique offerings elsewhere as well, including Asian stir fry, smoked meats and fresh soups and salads. Cinnamon-sprinkled Granny’s Apple Fries are a delicious evening treat – a LEGOLAND must-try. TravelingMom Tip: Consider eating a big meal before the event. On our next visit, I’d probably not take 45 minutes out of our limited event time to sit down and dine. However, the dinner was filling and prevented us from gorging too much on the goodies from our treat bag! Carlsbad is a seaside-area in San Diego county which offers plenty for families to enjoy. The weather in San Diego is usually quite warm in early October. Consider renting equipment at Carlsbad Lagoon for the morning and spend some time in the water. Use your afternoon to relax poolside or dine at one of Carlsbad‘s popular restaurants, like Pizza Port. Want to LEGO from day to night? You can purchase a full day admission to LEGOLAND California and add on the additional Brick-or-Treat Party Night event to the evening. This adds an extra $25 to the price of your park ticket. It’s definitely more economical this way as the Brick-or-Treat event alone is $59 (for only 4 hours). LEGOLAND traditionally participates in San Diego’s annual “Kids Go Free” in October, though Brick or Trick tickets are not included in the offer. I’d recommend purchasing tickets for LEGOLAND online ahead of time through Undercover Tourist as the prices are better than walk-up ticket pricing. TravelingMom Tip: Consider ending your night at the LEGOLAND Hotel for total LEGO immersion! 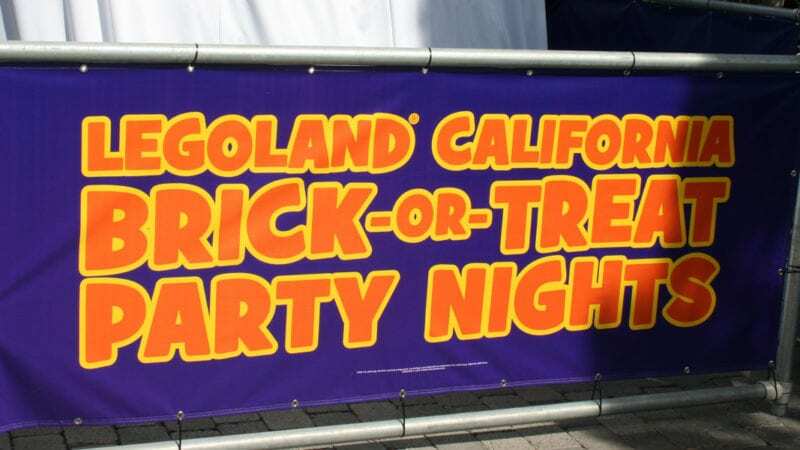 If you happen to stay over on Halloween night there is an exclusive LEGOLAND Hotel Halloween Party for Hotel guests. LEGOLAND California is located at 1 Legoland Dr, Carlsbad CA 92008. Parking for the day is $18. Do you know if you can still get it at 4pm this year? Thanks! Hi Veronica! Yes, you will still be able to enter LEGOLAND at 4pm if you have an event ticket. Do we need to bring our own bags or buckets for the treats or do they provide? We were just there a few weeks ago and they provided us with small treat bags. Have fun! Does my two year old need a ticket for Brick or Treat? She gets into the park free, but wasn’t sure about this event. Thank you so much for the in depth information on this event. You’ve cleared up a lot of unknowns for me. ? I do have a question for you, did your kiddos leave with a lot of goodies? hi I don’t know if you can answer this question for me, as you you know Legoland participates in the Kids pay free in October, so do we just pay the regular adult admission+brick or treat price and bring my kids into the park for free plus pay for the $59 price/child for brick or treat if we decide to stay? is that the most economical way to do so? Do adults need a brick or treat or just the participating children?